119180_01 Renae Vojtek (2nd from left) with work friends and committee members all set for Pink Riibbons Day. RENAE Vojtek is no stranger to battling cancer – and now she wants to help others. Ms Vojtek, who works at Victoria University’s Footscray Park campus, was diagnosed with breast cancer last year, aged 36. She is currently on holiday in Disneyland with her family to celebrate the end of her treatment. “I’ve worked at VU now for nearly 14 years, and I had a really good support network here,” she said. She was inspired to launch VU’s first Pink Ribbon Day last year after her colleagues asked what they could do to help her. That event raised $11,000 for the Cancer Council. This year, Ms Vojtek wants to go bigger and better – and she needs your help. 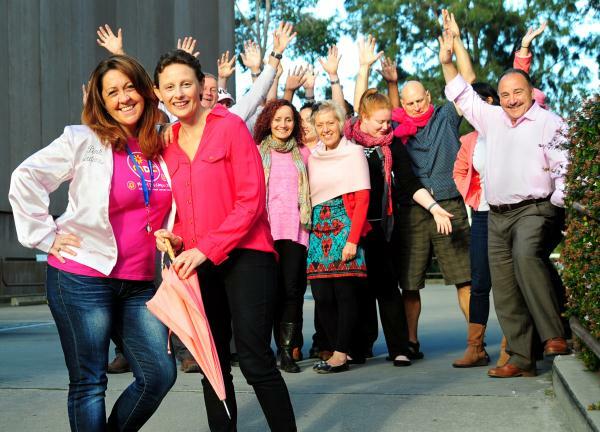 VU will host its second annual Pink Day fund-raising event on 2 October and is seeking donations of gifts or vouchers for raffles and auctions, food, non-alcoholic drinks, condiments, cutlery and napkins, pink balloons and decorative items. All money raised will be donated to BreastWest, a Western Health initiative set up in 2006 to raise money to improve patient care for breast cancer sufferers. BreastWest will use the money to provide everyday items that women suffering from breast cancer need, such as vouchers for patient transport to medical appointments, new bras for woman who have had a mastectomy and wigs for women who have lost their hair through treatment. The money will also be used to purchase vital medical equipment and supplies. If you would like to contribute to the event, email renae.vojtek@vu.edu.au or call 9919 4996.